Almost all players who suffered injuries during training camp should be cleared by kickoff. 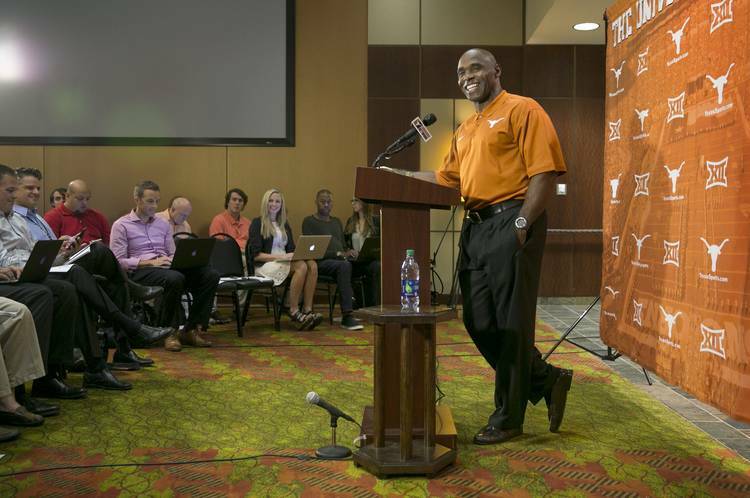 Truth be told, Charlie Strong has a strong dislike for the drama that sometimes engulfs the Texas athletic department. “We create our own drama,” he said in 2014. So it’s odd that Strong would be the one manufacturing it. On Monday, the Texas coach refused to name his starting quarterback for Sunday’s season opener against 10th-ranked Notre Dame. Basically, Longhorns fans who can’t get into Royal-Memorial Stadium must tune into ABC’s broadcast and find out. So why not announce whether it’s senior Tyrone Swoopes or freshman Shane Buechele and let the fans get excited? Sunday’s game is already loaded with pageantry. Bevo XV will have his grand unveiling. Olympic gold medal winners Kevin Durant and Tristan Thompson will be honored. Gov. Greg Abbott will serve as honorary captain. A dash of intrigue makes for great entertainment, right? Strong did admit that “whomever the starter is will end up being the starter.” His Yogi Berraisms aside, Strong means there is no two-quarterback rotation. Whoever trots out first against the Irish is the clear-cut No. 1. Judging from the players’ reactions and comments, they seem to believe Swoopes and Buechele are indeed interchangeable. That’s probably just what offensive coordinator Sterlin Gilbert wants to hear, too. They’re saying similar things in South Bend, Ind. Notre Dame coach Brian Kelly has not indicated whether he’ll start Malik Zaire or DeShone Kizer. The Irish are scheduled to hold their weekly press conference on Tuesday. Zaire authored the dramatic 38-3 win over the Horns last season, but got hurt the following week. Kizer finished the season and posted an 8-3 record as the starter. The quarterback news, or lack thereof, sucked up almost all the oxygen at UT’s first press conference of the season. But there was other news. Strong said all the key players who were sidelined during training camp should be cleared for Notre Dame. The Longhorns did not release a depth chart, either. But right tackle Tristan Nickelson and center Zach Shackelford should be ready. There was little talk about the defense, which needs to show improvement this season. Defensive tackle Paul Boyette Jr. said the players’ commitment level has grown since last year’s blowout. Some players wore dog tags, which are given out only by the coaches, for going above and beyond in training camp. “I just expect everybody to have fun and go out there and compete at the highest level,” Boyette said. True freshmen Buechele, Shackelford and receivers Collin Johnson and Devin Duvernay are all expected to play. Strong also called out freshman receiver Lil’Jordan Humphrey as someone to watch for. On the defensive side, Strong said freshmen will be used mostly as role players. Texas officials were the ones who agreed to move this game to Sunday night. The Longhorns have the national stage all to themselves. It could be quite a show, one way or the other.